Sometimes it takes a lot of trees to see the forest. In the case of the latest discovery made by astronomers at the University of Arizona, exactly 732,225. Except that in this case, the "forest" is a veil of diffuse hydrogen gas enshrouding the Milky Way, and each "tree" is another galaxy observed with the 2.5-meter telescope of the Sloan Digital Sky Survey. After combining this staggering number of spectra -- recorded patterns of wavelengths revealing clues about the nature of a cosmic target -- UA astronomers Huanian Zhang and Dennis Zaritsky report the first detections of diffuse hydrogen wafting about in a vast halo surrounding the Milky Way. Such a halo had been postulated based on what astronomers knew about other galaxies, but never directly observed. Astronomers have long known that the most prominent features of a typical spiral galaxy such as our Milky Way -- a central bulge surrounded by a disk and spiral arms -- account only for the lesser part of its mass. The bulk of the missing mass is suspected to lie in so-called dark matter, a postulated but not yet directly observed form of matter believed to account for the majority of matter in the universe. Dark matter emits no electromagnetic radiation of any kind, nor does it interact with "normal" matter (which astronomers call baryonic matter), and is therefore invisible and undetectable through direct imaging. The dark matter of a typical galaxy is thought to reside in a more or less spherical halo that extends 10 to 30 times farther out than the distance between the center of our galaxy and the sun, according to Zaritsky, a professor in the UA's Department of Astronomy and deputy director of the UA's Steward Observatory. "We infer its existence through dynamical simulations of galaxies," Zaritsky explains. "And because the ratio of normal matter to dark matter is now very well known, for example from measuring the cosmic microwave background, we have a pretty good idea of how much baryonic matter should be in the halo. But when we add all the things we can see with our instruments, we get only about half of what we expect, so there has to be a lot of baryonic matter waiting to be detected." By combining such a large number of spectra, Zaritsky and Zhang, a postdoctoral fellow in the Department of Astronomy/Steward Observatory, covered a large portion of space surrounding the Milky Way and found that diffuse hydrogen gas engulfs the entire galaxy, which would account for a large part of the galaxy's baryonic mass. "There are cloudlets of hydrogen in the galaxy halo, which we have known about for a long time, called high-velocity clouds," Zaritsky said. "Those have been detected through radio observations, and they're really clouds -- you see an edge, and they're moving. But the total mass of those is small, so they couldn't be the dominant form of hydrogen in the halo." For their study, scheduled for advance online publication on Nature Astronomy's website on Apr. 18, the researchers sifted through the public databases of the Sloan Digital Sky Survey and looked for spectra taken by other scientists of galaxies outside our Milky Way in a narrow spectral line called hydrogen alpha. Seeing this line in a spectrum tells of the presence of a particular state of hydrogen that is different from the vast majority of hydrogen found in the universe. 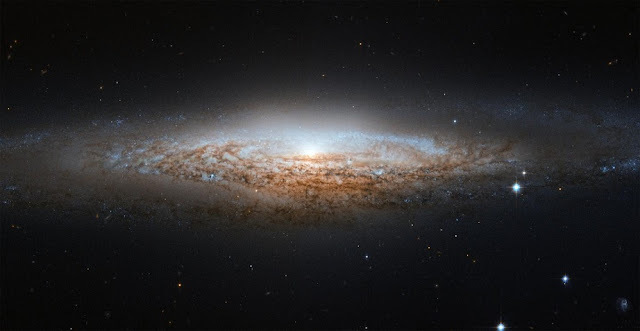 Unless neutral hydrogen atoms are being energized by something, they are extremely difficult to detect and therefore remain invisible to most observational approaches, which is why their presence in the Milky Way's halo had eluded astronomers until now. Even in other galaxies, halos are difficult to pin down. "You don't just see a pretty picture of a halo around a galaxy," Zaritsky said. "We infer the presence of galactic halos from numerical simulations of galaxies and from what we know about how they form and interact." "The gas we detected is not doing anything very noticeable," he said. "It is not spinning so rapidly as to indicate that it's in the process of being flung out of the galaxy, and it does not appear to be falling inwards toward the galactic center, either." "When you see things everywhere, they could be very close to us, or they could be very far away," he said. "You don't know." The answer to this question, too, was in the "trees," the more than 700,000 spectral analyses scattered across the galaxy. If the hydrogen gas were confined to the disk of the galaxy, our solar system would be expected to "float" inside of it like a ship in a slowly churning maelstrom, orbiting the galactic center. And just like the ship drifting with the current, very little relative movement would be expected between our solar system and the ocean of hydrogen. If, on the other hand, it surrounded the spinning galaxy in a more or less stationary halo, the researchers expected that wherever they looked, they should find a predictable pattern of relative motion with respect to our solar system. "Indeed, in one direction, we see the gas coming toward us, and the opposite direction, we see it moving away from us," Zaritsky said. "This tells us that the gas is not in the disk of our galaxy, but has to be out in the halo."